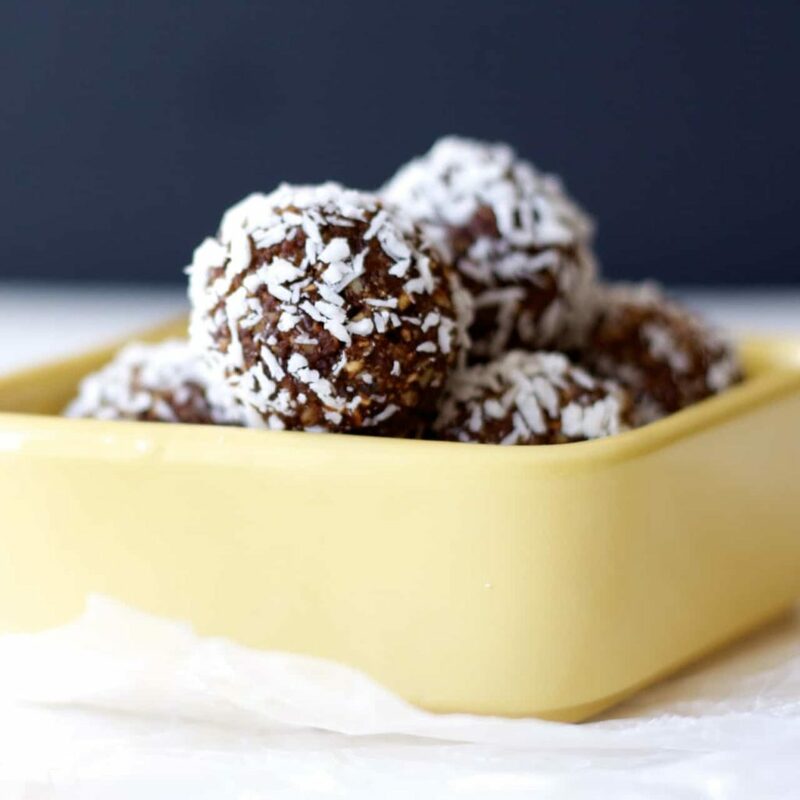 These apricot energy bites are a quick and easy to make snack that the kids will love. Healthy, nut free, and perfect for packing in the lunch boxes! I am constantly looking for snacks for my kids for school. And for after school. And for non-school days. Basically, I constantly need snacks for my kids. Kids are hungry a lot I’ve discovered. Something to do with growing I presume? Possibly?! At any rate, I make a lot of snack food around here to try and avoid buying the prefab snacks at the store. A lot of them ARE healthy, don’t get me wrong, but they’re certainly not cheap. And you go through them awfully quick with three growing (and hungry!) kids in the house! And a lot of those prefab snacks are NOT healthy and I prefer to avoid them for the most part. 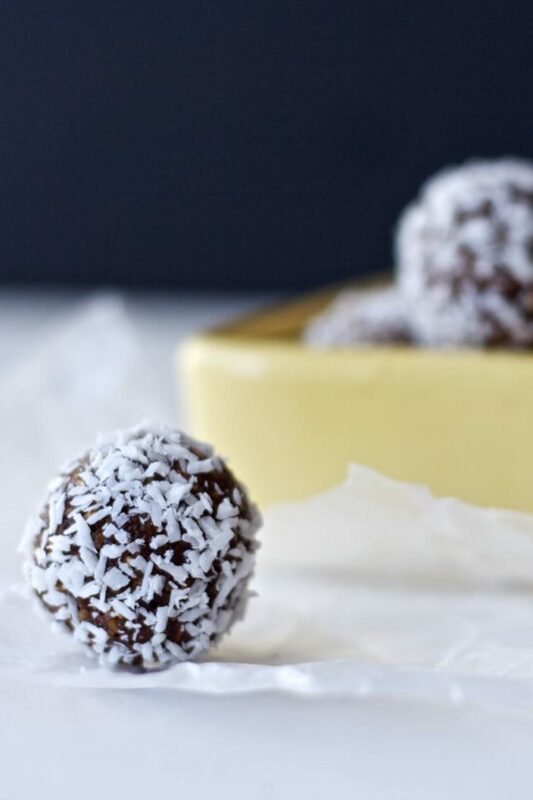 If I’m giving my kids something in the unhealthy vein, I prefer it to at least be homemade with real ingredients, rather than filled with chemicals, as well as sugar! So, I make a lot of snacks around here. Some are healthy, some not so much, but I DO try to make most of our snack food as opposed to buying it. One of the things I have been trying to come up with is an energy bite type snack, that doesn’t have nuts in it. My kids love nuts, and can eat them, but our school is nut free, as a lot of them are now, and I really wanted to come up with something that could be sent to school. Every single recipe I saw for energy bites had nuts or nut butter of some sort in it though, so I started experimenting. These apricot energy bites are the ones that we liked the most. My kids loved these. They’re chewy and filling and sweet enough to feel like a treat, even though they’re quite healthy. There are no nuts in them, and only a small amount of honey added to help bind them together. The dates and dried apricots add enough sweetness without needing anything else. And they’re coated in coconut to make them pretty, and just cause coconut is good! My kids loved these apricot energy bites, and are asking me to make them again soon, as they did not last long. So if you’re looking for a healthy and energy filled snack that is also nut free, give these a try! They come together very quickly and the kids love them! I’ve also share this Apricot Energy Bites recipe over on Food Fanatic, so make sure to check it out there! Exactly! A little healthier when you need a snack! Thanks Erin! These sound delicious! I love energy bites like these. They're so handy and convenient! I love energy bites! I love this combination with apricots and dates! Can't wait to try! Great healthy and tasty snack. I will definitely try it with my kids. Thanks! Thanks so much! Hope you like them! I do that too, we'll have snacks everywhere for a while, and then I don't make anything for a long time and we raid the freezer! Thanks Mira! 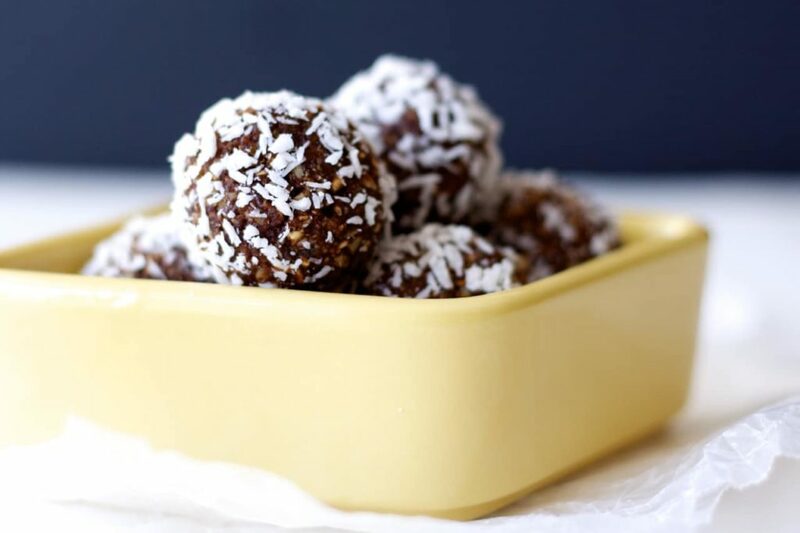 Love these energy bites! My kids are hungry all the time too so these would be gone in no time! Evidently it's a common thing, I guess kids are just always hungry! :) Thanks Kelly! You're such a good mom, Stacey! I feel virtuous if I shop for my kids' snacks in the whole foods section of the grocery store. They just eat everything up too fast! These look really good. Well thank you Mir! That, or I spend too much time in the kitchen, one of those! I'll go with yours! :) Thanks so much! These sound so yummy! We don't have small kids in the house anymore but this is my kind of light snack especially as we're heading into warmer weather! Nothing too heavy! I was a bottomless pit when I was younger! Well, who am I kidding--I still am! These look super delicious and so, so good for you! Loving these! Haha, yeah, me too! Thanks Michelle! I am always looking for snacks too! I'm the worst at remembering to buy and pack snacks for work days and I always end up stuffing my face when I get home! I love apricots and these sound like the perfect thing to take with me! Haha, I've found that toddlers go through 2 stages: need to eat ALL the time and don't want to eat ANYthing. Lol. But I'm sure she would LOVE these! That's so true! I've discovered as they get older they don't really hit those not wanting to eat stages anymore though! Thanks Ashley! How funny Stacey that my post today was very similar to yours. These darn kids are gonna eat us out of house and home huh? I love these bites and apricot was a genius idea. Can't wait to try them! Pinned!! Is it? Funny! Especially since I wrote this for FF almost two months ago! It's true though, they are always hungry! :) Thanks Cyndi! Ahhh! The apricot in these little bites are just genius, Stacey! Yum! We love dried apricots, so it was an obvious choice! Thanks Justine! sounds delicious! will definitely try these! Yum! I love apricot! Definitely going to have to try these soon. These energy bites sound delicious, Stacey! I've never made one with dates before, so I definitely need to try that. And I love the apricot in here, too. Sounds like the perfect healthy snack!